This standalone data logger measures and stores up to 32,510 Carbon Monoxide (CO) readings over a 0 to 300ppm measurement range and -10 to +40°C (14 to +104°F) operating temperature range. Easily set up the logger and view downloaded data by plugging the unit into a PC’s USB port and using the free EasyLog software provided. Data can then be graphed, printed and exported to other applications for detailed analysis. Supplied with ½ AA battery and wall mount clip. Please note. 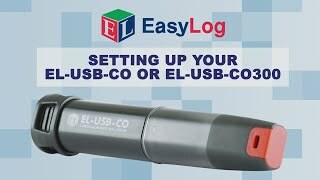 The sensor life on a EL-USB-CO300 logger is typically 4 years. You can find the exact expiry date in the EasyLog software under Current Status. IMPORTANT SAFETY WARNING EL-USB-CO300 is a professional instrument that is designed to measure and record levels of Carbon Monoxide (CO) in air over a period of time. It takes a sample reading at set intervals for recording / monitoring / analysis purposes. It is not a suitable substitute for a domestic or industrial Carbon Monoxide detector/alarm.